When you go abroad, the one thing you must not do is judge another country by your own. You have to accept each place and each culture as it is, not supposing it deficient if it is not like yours. (It’s only deficient if it fails to meet the perceived needs of the people living in it.) Americans often make this mistake, and so do Englishmen. There’s a television program programme here in which English couples are trying to decide whether to buy property abroad. Often one of the specs they give the presenter is that they are eager to become involved in local community life. Does that mean they want to meet the French, or the Italians, or the Spanish? NO. It means they want to meet other expatriates, other Brits! When my friend Sylvia and I, then airline employees, took our two daughters to London and Paris the summer after their high school graduation, the girls made the same mistake. It very nearly ruined the whole trip for them. Erin wrinkled up her nose to see a very well-behaved poodle sitting at its master’s feet in a restaurant. She was appalled at how people dressed in Paris, where she had expected everyone to have stepped right out of the House of Dior or something. “Grungy” was her word. (I personally couldn’t see any difference between the way the Parisians dressed and the way she (and Sondra) dressed, but they said they did.) The only place they wanted to eat was the Hard Rock Café. Might as well have been in America! But if I ever go to a place where the natives live in grass huts, then a grass hut is where I want to stay! If the locals eat something called “Toad in the Hole,” then I want to sample it, albeit with trepidation. If they wear togas or saris, that’s what I want to wear. Okay, so i stop short of a grass skirt with nothing above that; nevertheless, when you come to a foreign country, my philosophy is, it ought to be to share their life as much as time and other circumstances permit. Not to carry around your own life, like a turtle with its home on its back. Because coming to know something of another way of life is the most interesting, most enriching thing of all. That said, there’s a new television series on here called something like “Holiday Hijack!” in which vacationers actually do share the lives of the people in the countries they are visiting. And sometimes that way of life is impoverished, unsanitary, diseased, and all around difficult and the holiday-makers find themselves miserable. I’m not talking about that, but I still think so long as you are well vaccinated, participating in a very hard lifestyle, sharing in the privations as well as the joys of others’ lives at least for a while is a priceless experience. Travel won’t broaden you if you don’t let it. The libraries, at least here in Lancashire, no longer enforce quiet. I know, because I asked. People are even permitted to yak on their mobile phones. So I was standing beside a bus at a busy intersection, waiting for the light to turn. When I happened to glance up at the bus, I noticed that all the passengers on my side were looking at me. The reason for their gawking became apparent when I read the signage on the bus. It was a tour bus passing through little Ormskirk, and the tourists in it were all trying to get a good glimpse of the locals! On Saturday, we went with David and Julia to the Lake District. Julia had been given a gift card voucher entitling her to tea for two, so we had tea for four and split the difference. The tea was at the Samling, one of the posh hotels in Windermere, on the banks of the Lake. The hotel sits on 67 acres, a number of which were done up in formal gardens, fun to explore, with all the little niches and pools and gazebos. I finally learned the name of that dark purple flowering plant; it has long clusters of tiny blossoms, like lilacs, but darker and longer. It’s Buddleia or buddleja, the Buttefly Bush. Another plant we saw there had leaves bigger than I ever thought could exist. The leaves, as nearly as I could estimate, were at least four feet in diameter, and many were six feet! We had no idea what these plants were, but the undersides of the leaves were full of thorns, arranged along each vein. They were truly like some Disneyworld fantasy! Tea was high tea, an entire meal of sandwiches (ham, cucumber, egg mayo, salmon), scones with clotted cream and strawberry jam, and an assortment of other sweets, more than any of us could eat. As it was a perfect day, bright and warm, no humidity, we ate outside on the terrace. The sky was a different blue than I could ever remember having seen before, a sweet, tender color; and the pastures and hedgerows –English greenery has the same hues we have in America, and indeed the same shades and tints, but what’s different is the saturation. The English greens are more vivid than ours, as if God, when He came to the making of England, had used double-strength dye. The sheep were grazing peacefully in the meadows, a dozen small sailboats were crossing the sparkling water, and the whole effect was of living inside a picture postcard. To add icing to the already-iced caked, an air show was in progress over Lake Windermere. It was fun to watch the acrobatics, the designs left by the trails of smoke in the sky, and the World War II vintage planes passing over, fighters and bombers. Spitfires, David said, and Lancasters. I’ve now been to quite a few places, from the tropics to the far north, from as far west as Hawaii and as far east as eastern Greece, and I have to tell you that absolutely nowhere I’ve seen is more beautiful than the English countryside on a glorious day. It’s still like early Spring here. The sunshine, when we have it, is warm (not hot) and the breeze, which we always have, is downright cold. Why do the English so like discussing the weather? Because they have so much of it! But truly Saturday was one of those heavenly days that makes all the gray ones worth it. Even more satisfying is that we took full advantage of it, with good company, good food, and being outdoors. Again this year we attended the concert in Rainford of the Rainford Band. They are a very good band and have received numerous awards. It was a picnic concert, so to speak, held within a very large local barn. You brought your supper with you and ate before the music began. We dropped the ball this time, having forgotten that until the last moment, and by the time we remembered and got in touch with David and Julia, they and the four others coming with us had already arranged among them an entire gourmet feast. The others were Annalie, a German general practitioner who lives near Julia and David, her “partner” Peter, and their friends Fran and Colin, a married couple (presumably). Anyway, it was a wonderful concert, theme music from popular movies. One soloist managed to make her cornet sound actually sweet, rather than, well, brassy. Another soloist did much the same on the horn (meaning, of course, the English horn). And for the finale, the much-awaited patriotic selections from the last night of the proms. The U.K. and the English flags were passed out for us to wave, and on our feet, the wildly enthusiastic audience sang sea songs, followed by Jerusalem and Rule, Brittania and finally Land of Hope and Glory (to the tune of Pomp and Circumstance), with full vigor and voice (to the extent that David was hoarse the next day). I just love it! I’m sorry, but I can just picture the cynical elite of any given nation smiling to themselves at such sentiments, held by people too naïve to have any idea the real purpose of their sacrifices, which is almost always to make the rich richer. Our American patriotic anthems lack the rousing quality of British ones. I mean, God Bless America and America the Beautiful are more stately and grand than rafter-ringing. The rousing ones, like certain Protestant hymns, are more fun to sing, aren’t they, giving much visceral pleasure while catering to national and/or religious pride. We didn’t get much chance to get to know the others in our party, but we could tell they were all very amiable people, enjoyable company. So we had an altogether delightful evening. Where’s Professor Higgins When You Need Him? Most people already know how the Brits mangle “garage” (they say “GARE-azh”!) but they do it will all sorts of other words, too. They say “et” instead of “ate” and whereas everybody knows “fillet” is pronounced “fill-LAY”, they said “FILL-let”. It’s true. But after all, you say, that’s exactly as it’s spelled. Then why do they say, “Lester” and write it, “Leicester”? And “scone”! Did you know that despite its spelling, it does not rhyme with “own” but with “on”? As if you were about to say “sconce” but never finished the word. The English say “clock” when they mean “clerk” and something close to “cloak” when they mean clock. One of the main streets here in Ormskirk (“OHMS-kuk”) is West Derby, but do they say so? No, they say, “DAH-bee”. They say “lorry” instead of truck, “trolley” instead of cart, “footpath” for sidewalk, and traffic signs, instead of saying, “One Lane Ahead” say “Single Carriageway”. Not only that, people here completely botch numbers and the alphabet. Suppose somebody over the telephone is reading back your account number: “Haitch, double-six, zed, nought, triple-four”. By the time you’ve mentally decoded “double-six” and figured out it’s not a throw of the dice, you’ve missed the rest. It’s no wonder you have to ask for the number two or three times twice or thrice (Yes, they do say “thrice”) before you can figure out that the number is H66Z0444. There’s even a murder mystery series by Martha Grimes featuring a valet named Rivven. I’ve spelled spelt that as it sounds; you’d go mad trying to guess how it’s written in the book. So I’ll tell you that in defiance of every principle of phonetics, it’s R-U-T-H-V-E-N.
You see? Even Henry Higgins, for all his singing about “the cold-hearted murder of the English tongue”, isn’t entirely innocent. Professor, the British may not learn English, and the Greeks certainly no longer learn Greek, but Arabs learn Arabic! Forgot to tell you about James' 30th birthday on 9 July. (James is Demetrios' godson.) His parents, David and Julia, and his girlfriend, Kim, threw him a surprise party. That is, he knew Demetrios and I were coming, but he didn't know anyone else was. He was particularly annoyed that his brother, Nick, had texted him that he had gone back to Chester, where he lives, and might not come for the birthday dinner. He did, of course. There were about 20 of his friends and relatives and Kim's friends. Julia and David did most of the work, the cooking and so forth. It was a glorious day, so we were able to have the party in the garden, and it was all lovely, especially meeting the people, young and old (and very, very young, as in infants). One of the babies, little Alfie, fell asleep in my arms, much to my delight - and his mother's, I think. We've also had Agnes from next door, and her sister Anna, here to tea, and that was also very enjoyable, as they are both good conversationalists. Agnes and I had gone out to tea the day before at one of her favorite local eateries, called The Farm. Sunday after church we met some new friends and reconnected with some from last year and all had lunch together afterward, six of us. The Penal Substitution theory of atonement came up in BOTH my Bible study groups last week. I'm glad to say Anglicans don't much go for it, at least not in any big or insistent way. The only question that arose from the discussion was the usual, 'Then why did Jesus die?' and the Orthodox explanations were received with openness and appreciation. If you're new to this blog and interested in that topic, type 'Why Did Jesus Die' in the search box, near the top right corner of this page. We had Claudia and David to dinner on Saturday. Claudia is the one from whom we purchased our flat. She and David are wonderful people, and I'm pleased to report that they arrived at 1 p.m. and stayed until 8. So many more people we want to have over, and so little time! We've been so remiss so far, so lazy. Well, catching up is going to be a lot of fun, anyway. Rugby games are starting up again, very near our flat, Fridays nights. We're hoping to attend some of them. Schoolchildren finishing up this week, at last, and beginning their summer break. Tomorrow night we'll attend the concert of the Rainford Band with Julia and David, and then Saturday we're going to tea in the Lake District. ...so you know we're still having great fun doing very little! I took another fall a few days ago, but am entirely unhurt in any way, lucky me. I lost my balance in the shower (don't ask) and fell in slow motion, having grabbed the shower curtain. I did have the presence of mind to let go the hand-held shower in time to keep it from ripping out of the wall. Ended up looking quite ridiculous, at right angles to the tub, my back on the carpet, my knees over the side of the tub, with the shower curtain on top of me. Well, it gave me a good laugh, anyway. As the medicine cabinet we put up so inexpertly last year has also come down under the weight of all the toiletries in it, our bathroom looks a proper wreck now; we're having a man come in on Saturday to get it back in oder. I was lazing around in my robe the other day, not even having combed my hair or washed my face, and was knitting, thinking in another half hour I'd get around to being civilized, when the buzzer rang, the intercom at the outside door. It was a neighbor who asked if she could speak to me a moment, so fearing some sort of urgent problem, I let her in. She had just come to meet me! Her name is Agnes and she's ever so nice. Eighty-some years old, and has an older sister living in our apratment block as well. Anyway, she invited us to tea in her flat, and yesterday was the day. Her sister Anna came, too. Agnes had done her homework! She has a small bookcase in her living room, but it seems to be full of all sorts of reference books. Agnes had looked up Richmond, Virginia in her atlas, and had looked up "Anastasia" in her book of saints' names and had found my saint, the Roman matron, the Pharmacolytria, and had read about her life. Now I think that's impressive! We're all going out to lunch one day soon at their favorite area restaurant. I just need to fix the day. I've now met enough people that once in a while one of them calls out to me in the street, and I do the same. Now that's fun! You begin to feel a part of town life. Because we were here on Sunday afternoon (for a change), I discovered that there's a concert in Coronation Park's bandstand every Sunday afternoon. I had assumed it would all be rock bands, but not so. This was a more varied band, and I enjoyed them very much. The final number was, of course, "God Save the Queen," and I am either pleased or sorry to report that I was the first one to my feet and the only one to sing the words. To the tune, you know, of "My Country, 'Tis of Thee". Elias came for lunch yesterday and for a special treat, brought his elder daughter with him, Maria, whom we haven't seen since last year. I love cooking for him as he so obviously loves eating it. And that's the news from Lake Woebegone Ormskirk. After church in Liverpool on Sunday, we went for coffee with our dear friend Elias, and as we climbed out of his car and were about to walk toward the cafe, we heard drums. The drumbeat was loud and quite fierce, coming from about a block or so away. I ran to the corner in time to see the parade approach; several drummers, drumming most aggressively, followed by a dozen or so hand-held accordions. What was this? What was the occasion? Then my question was answered, for behind the accordions came schoolchildren, and each of them was wearing an orange sash over his or her shoulder. Orangemen. Named after William of Orange, the Dutchman who became King in 1688, the Orange Order is that (in)famous Irish Protestant fraternity, supporters of English rule in Ireland, and you've probably heard of their provocative annual marches. As this band passed another intersection, another contingent emerged from the side street and joined them, doubling their ranks. And where were they going? Straight toward the Catholic Cathedral, two more blocks away. I was appalled . Appalled to witness firsthand the sectarian hatreds being passed down to these small children. As Demetrios put it, "Here are people who violated another country and are still proud of it." And then again, I was also thrilled because it seemed to me a history book had been opened and I had stepped right into it. 1795 is when the Orange Order was founded. We stood there on the corner gaping for a few more moments, then decided this might be a very good time not to stay around, so into our coffee shop we went and spent an hour greatly enjoying one another's company. Elias had to leave to sing at a 3:00 wedding back at the church, so we left when he did, and thought this might be the day to have a look at the inside of "St. Paddy's Wigwam," as Catholics (and others sometimes call their Cathedral. There are 56 steps to climb to reach the Cathedral's main door, but we didn't find it difficult. I suppose we've become stronger from all the walking we do here, plus I weigh a lot less than I used to, so we managed without any ado. This is a building you either love or hate. I did not love it. Demetrios said he thought it would make a lovely concert hall, but I didn't think so. 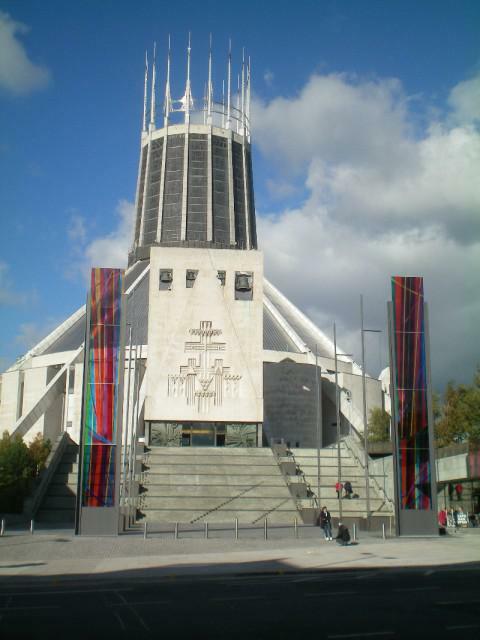 Around the circular nave are four towers, nicknamed John, George, Paul, and Ringo, after the Four Evangelists Beatles. 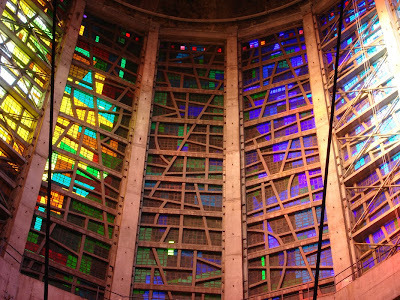 There are 16 steel girders in a circle, sloping inward to form a conical roof, and poking out of the dome meant to look like not a teepee but a Crown of Thorns. The inside ceiling has more girders in concentric rings. My feeling of sitting inside a spider web was accentuated by the gigantic chandelier, a tangled mess, just like the stained glass dome above. 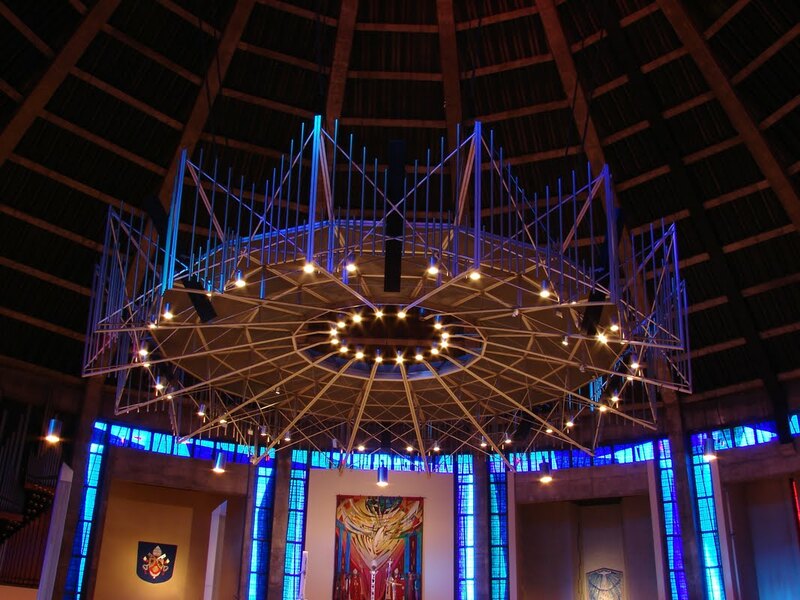 The blue narrow panels of blue glass either side of each girder did not help, as they gave the nave a cold look. The chancel is a circle elevated 2 steps from the main floor, and the high altar, in a smaller circle elevated 3 more steps. (The bishop's easy chair, center background in this photo, is elevated 6 steps.) As the altar sits on a circular platform, it can of course face any direction; it faces northwest. The altar is of white marble, and I can think of nothing that looks colder than white marble in blue light. There is a Lady Chapel, and it has more agreeable lumination. Its focal point is a wall-mounted sculpture of Madonna and Child. Little Jesus is tucked between his mother’s legs, she straddling Him, and He just fits, with never a millimeter to spare. The odd impression thereby created is of a woman giving birth to a toddler tiddler. There are numerous other chapels around the circumference of the nave, some of them more agreeable, most not, in my opinion. 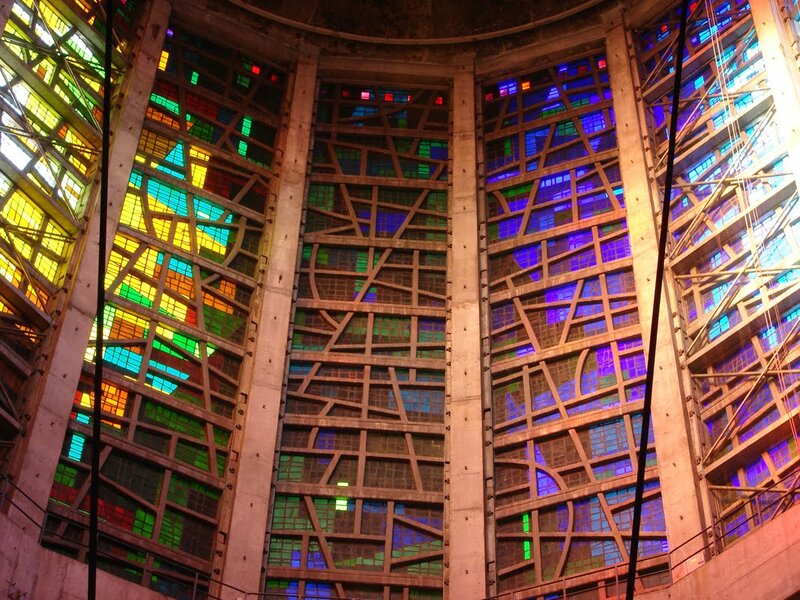 The Reconciliation Chapel, for confessions, has narrow glass windows all in scarlet. I suppose the symbolism is of the Blood of Christ, which although appropriate theologically, is an aesthetic disaster. All the art is very modern, meaning most of it is deliberately ugly. Even the statues are Picasso-esque, notably one of Abraham freeing the ram from the bush, which yuo can see here. Evening Prayer was in progress as we entered the Cathedral, and it was interesting to note that in England, Catholic chant sounds very much like Anglican. That's to say it was lovely. “Same sort of dress code, too,” a man’s voice added. “I’d have to be taller and thinner, though,” Demetrios said, laughing. And that’s how we met Susan and Brian, two lovely people about our own age. They aren’t married but are good friends. Well, I rather think it does. Brian wondered whether we knew of the Greek Church not far away, and we said yes, that’s our church. Susan said she’d like to visit it. And then, of course, as they were Catholic, we began discussing the prospects of unity. They felt it was mostly a matter of perspective, of people looking at the same things from different vantage points. Demetrios said the issues really were doctrinal, and it was terribly important to get the doctrine right. If you get the doctrine of God wrong, you’ll also get the doctrine of man wrong, as man is created in God’s image; and you’ll mess up the relationship between God and man, as well. Anyway, at Susan’s suggestion, we ended up exchanging contact information, and as we liked them very much, we intend to follow through on it, too. Finishing our tour of the Cathedral, Demetrios wasn’t ready to go home yet; it was too glorious a day to be indoors. So, having discovered our train ticket to Liverpool enables us to go anywhere on the Northern Line, and can be used all day long, we decided to go to Birkdale. Last year we drove through a part of it that contained some big and beautiful houses, and Demetrios was hoping to find them again. It was evening before we arrived in Birkdale, though, and we were more tired than we had expected to be. So we thought we’d have a little supper first. We passed a pub, but nobody there seemed to be eating, only drinking. Then we found a restaurant, but it looked very expensive, too posh for our inclination this time. Demetrios embarrassed a couple of the locals by asking where the town center was, with cafes and pubs; the answer was, this is it. Eventually we found the Park Hotel, the ground floor of which is a pub serving food all day. Demetrios had a burger and I had fish and chips. And then we simply returned to the train station and came home, exhausted and happy. Don't know what got into me last time I posted; there were/are indeed some things to write home about! For starters, James (Demetrios' godson) and Kim took us out to dinner. Letting the young people pay felt bad, but the thought that they wanted to made our hearts swell. They're always good company, too. A few days later, last Thursday, we went out with James' parents, David and Julia, to the Swan Inn, probably the nicest restaurant in the area. It never disappoints, as David likes to say, and we enjoyed our evening with them very much. Saturday was bright and dry and actually warm (for the first time all summer), so we hopped on a bus and went to Southport, one of our favorite places to visit, a Victorian seaside resort town. 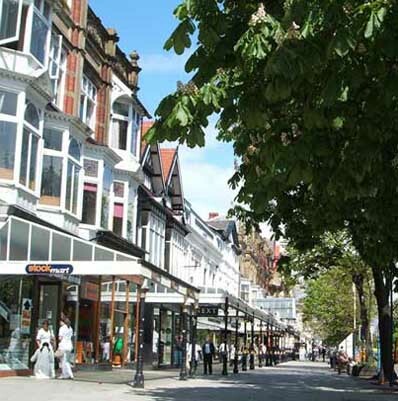 We had a wonderful time poking around in the shops in Lord Street, the main drag, with its glass arcades and its red brick-in-asphalt paving. All of God's children got some shoes. Gonna walk all over God's heav'n! 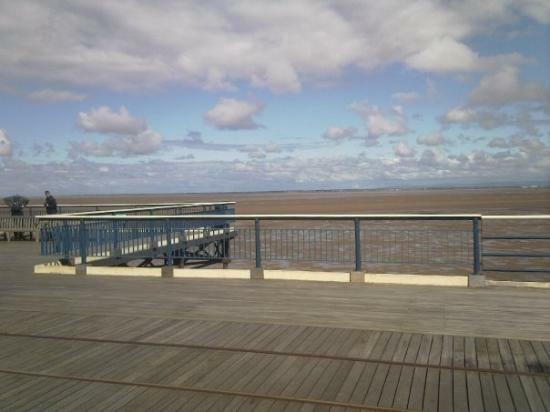 After a lunch of sandwiches, we walked along the pier, and just enjoyed the sights of holiday-makers having fun. There's a miniature railroad and a golf course, and motor boats or speed boats to rent. People were picnicking on the sand; a few had braved the mile-long walk across the sand (and mud!) to reach the surf, where they were getting their toes wet. There is even an area like a skateboard part, but for bicycles. We watched the kids doing all sorts of fancy things on their bikes. We didn't particularly want to do any of these things ourselves, although when Nick and Sharyn get here at the end of August, we may like to do a boat ride - or even the small plane ride. Watching the other people seemed to us the main form of enjoyment. We had tea in the Nostalgia Tea Room, one of our favorite places in Southport. The waitresses dress in black, with white, lacy caps and white aprons. The service is excellent, the house blend of tea is delicious, and you get all the trimmings. To be traditional, I chose a fruit scone with clotted cream and strawberry jam. And then our age caught up with us; we were tuckered out and we found it was already 5:30 anyway, so we took the bus back to Ormskirk, getting off very near our own, swett doorstep. ...but nothing to write home about. We're doing some of the same things we always do, just in England. Have some special things lined up, but for now it's working on D's book, doing my charity knitting, attending our various groups, walking around Ormskirk, exploring it, reading a lot, both serious and fun stuff. Weather is not co-operating. We're veen lucky it's mostly dry, but still cold. Cold, not chilly. There has been only one day when we could go out without sweater or jacket (and even that is sometimes not quite enough), and we still have the radiators going most nights. I'm (temporarily, I hope) sick of blogging, though. Much more fun to read other people's blogs!